" It is hoped that more than Rp 200 billion of tax realization can be reached. 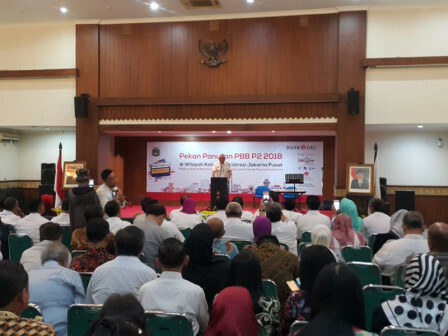 Our target this year is Rp 1.459 trillion"
160 taxpayers are attending an event called Urban and Rural Land and Building Tax (PBB-P2) Week held by Central Jakarta Tax and Local Retribution Sub-Agency. "It is hoped that more than Rp 200 billion of tax realization can be reached. Our target this year is Rp 1.459 trillion," expressed Adi Wirananda, Head of Central Jakarta Tax and Local Retribution Sub-Agency, Wednesday (9/5). Up to September 3, tax realization in Central Jakarta reached Rp 707.337 billion. "We're optimistic that it can hit the target," he stressed. In the meantime, Jakarta Tax and Local Retribution Agency Head, Faisal Syafrudin who also attended uttered that it is hoped able to get support and cooperation of such taxpayers. "Pay on time, as all city development is covered by taxes," he said.